When I came back to running in June of last year, the plan was simply to lose a bit of weight and complete a 10K. I enjoyed that first 10K so much that I signed up for another one, and within a couple of months I’d joined Run Dem Crew and found myself signing up for my first ever half marathon, and my first Bridge the Gap event, in Amsterdam. That run was the first time that I enjoyed a race from start to finish. Charlie Dark, the founder of Run Dem Crew, says that if you put the work in during training, the race itself is a celebration, and I found that to be true in Amsterdam. Over the next few months, I had a great time running 10Ks and half marathons, and felt like I’d found my natural distances. The half marathon is more than double the 10K distance, but to me it didn’t feel like such a huge step up. The jump from half to marathon, however, is significant, and I’ve discovered during training just how much of a toll it takes on the body. Towards the end of the winter, some Run Dem friends, Emma and Tim, mentioned they were doing the Bournemouth Marathon, and they encouraged me to enter. My interest was piqued. I began to believe this time I could have a positive marathon experience- one to neutralise the negative one I’ve had previously. The timing was good. With an early October race date, I’d be able to use the extra free time I would have during the summer holiday from teaching to put in all the extra miles. I took the plunge and entered, and soon several other friends did, too. Received wisdom seems to be that you need about 16 weeks to train for a marathon. I now see I made a mistake in my approach to the first part of this training. I had entered the Down Tow Up Flow half marathon at the end of July, so I spent the first 6 weeks of the training programme following a half marathon plan. I was running about 25-30 miles a week. After running the race, which you can read about here ( https://anotherwisemonkey.wordpress.com/2013/08/07/down-tow-up-flow-half-marathon-race-report/ ) I switched immediately over to week 7 of the 16 week marathon training. I really need to big up Cory and Jeggi for putting on the fantastic track sessions at Paddington Rec on Tuesdays. Thanks to Charlie for being the inspiration that brings us all together- none of the good experiences with my running family would be possible without him. Also Barbara, from EnergyLabBTS, really helped me develop my running form. The problem is, when you’re improving every week, it’s very tempting to keep on pushing to the max. One week, I ran suicide pace at Run Dem on Tuesday, then did my long run on the Wednesday, then 9 miles at track on Thursday, followed by the infamous Swain’s Lane of Pain 10 miler on the Saturday. This is a devilish run devised by Barbara Brunner of EnergyLabBTS, which involves running 10 miles down and then back up a diabolically steep hill in Highgate. I actually expected to crock myself that week, and when I didn’t I guess I thought I was invincible. I was building up the distance on my long runs and everything was going well until the day of my first (and last as it turned out) 20 miler. As I set out that day, my left calf felt a little tight. If there’d been any pain, I’d definitely have stopped immediately, but there wasn’t. It was much more the sort of niggle runners are used to feeling as part of their weekly routine, so I just ran through it. I completed the 20 miles comfortably enough, but afterwards my left calf felt super tight. The next day, the calf swelled up like a ham, and just like that, I had my first relatively serious running injury. It was a grade one calf strain, but heaven help anyone who gets a grade two or three. It was a pretty scary moment, and I realised that I might not be able to run Bournemouth. I particularly want to thank Manni for his kind words and thoughtful analysis of what had happened when I was feeling anxious about it. I had to drop out of the Run to the Beat half marathon, which was disappointing, but I had a great time cheering on the crew, and was so pleased to see Jeroen, who took my place, set a PB. Fortunately, a week of complete rest from running, and applying the RICE method of Rest, Ice, Compression and Elevation, was enough for the swelling to disappear. I spent the next week doing very gentle 20 and 30 minute runs, with days of rest in between, and continued the icing. The last couple of weeks I’ve been able to return to my training plan, but have cut down from 5/6 runs a week to 4. I was tempted to try to make up the missed runs at first, but saw sense after listening to advice from friends and family. 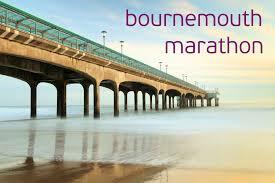 So here I am, one week to go and ready to run my second marathon. I had such a bad experience the first time, and consequently ran so slowly, that as long as the leg holds together, I should be able to run a PB. But the time doesn’t really matter. The important thing will be to enjoy it this time. I’m grateful that I’ll even be there, as things didn’t look good when my calf swelled up. I’ll be in Bournemouth with good friends and I intend to enjoy every moment. Big up to Tim, Emma, Pistol Pete, Dave Cregan, Nathaniel, Leeanne, Noushi and Ric. Sending love to Azra Zakir, who is one of the strongest women I know, and who would be running Bournemouth with us if cicumstances hadn’t conspired against it. I’m excited to see my friends Tunde and Hope, who live in Bournemouth and who I’ve not seen enough lately. I want that Amsterdam experience of running with a smile on my face. The hard miles are in the bank, the training is done, and now it’s all about tapering sensibly and getting to the start line feeling good. 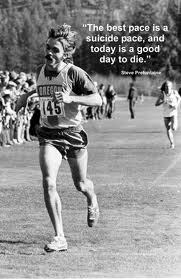 As Charlie Dark says, it’s not how fast you go, it’s how you cross the finish line.